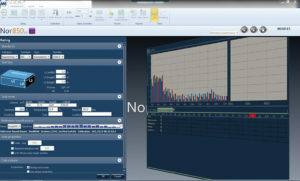 The Nor850 distributed multi-channel system offers a flexible, computer-based platform for noise analysis, building acoustics, sound power measurements and sound intensity mapping using Norsonic’s line of sound level analyzers or multi-channel systems. 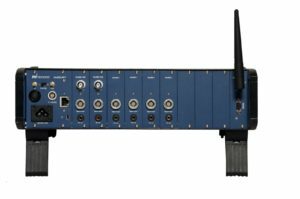 The system supports Norsonic’s single channel Nor140 analyzer, one or two-channel Nor150 analyzer or the Nor850 rack containing up to 10 channels. 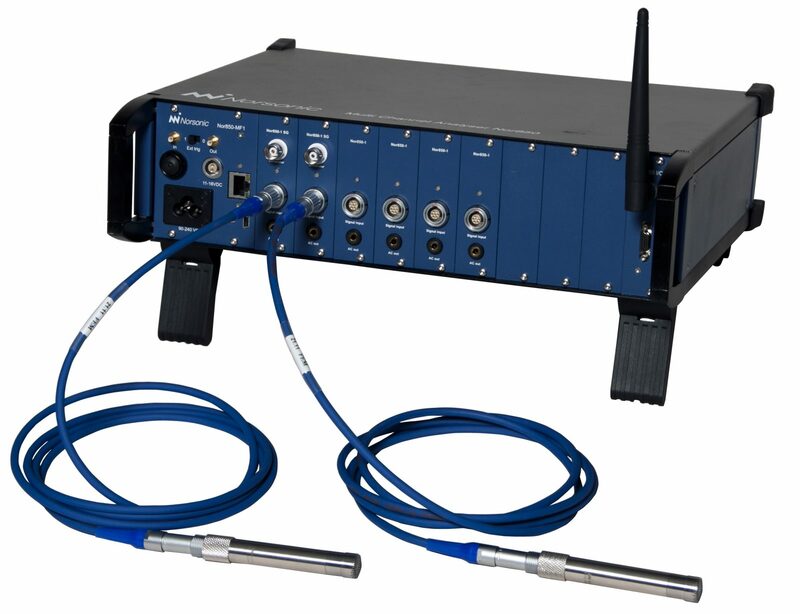 By connecting a combination of individual measuring units through various communication channels – including both standardized LAN and USB interfaces – the user may create the optimal multichannel system for any task. Wireless communication through BlueTooth or WLAN is also available. Multiple systems can be connected and controlled using a single PC. 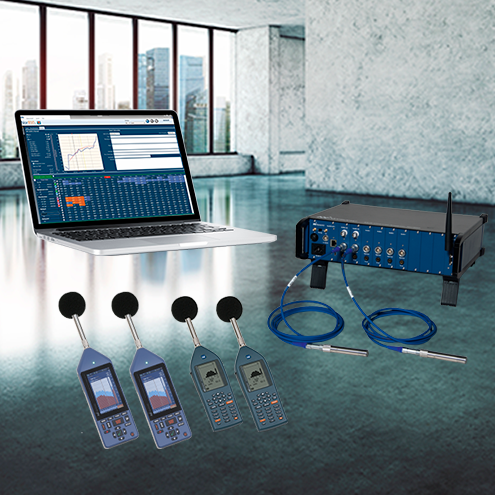 The Nor850 software offers users the capability to conduct noise, building acoustics, sound power measurements and sound intensity mapping using Norsonic’s line of sound level meters and multi-channel systems. 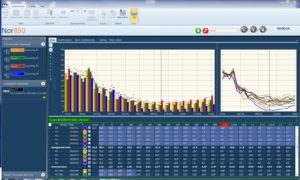 Analysis and reports can be generated through direct measurements or by importing measurements into the modules. 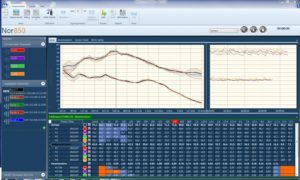 In addition, the software also allows users to import measurements made by other instruments. The general analyzer module allows for level versus time multi-channel sound pressure level measurements or level versus frequency analysis in 1/1 or 1/3 octave bands. 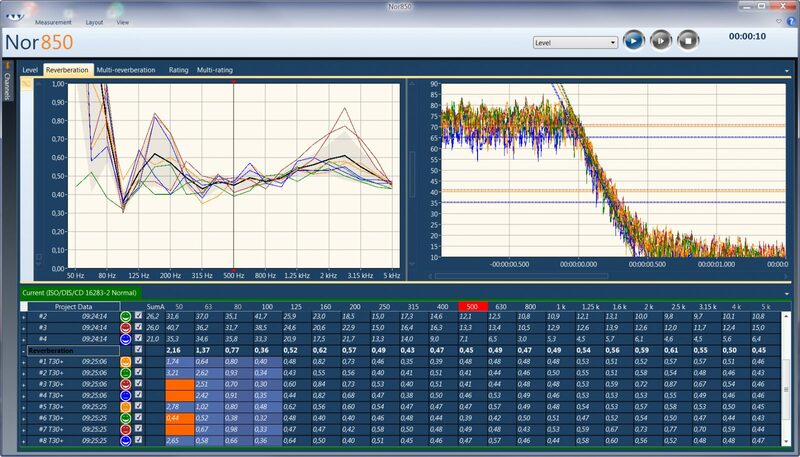 This module can be used for product quality control and assurance using a reference curve where the low and high level criteria can be defined in each 1/1 or 1/3 octave band. 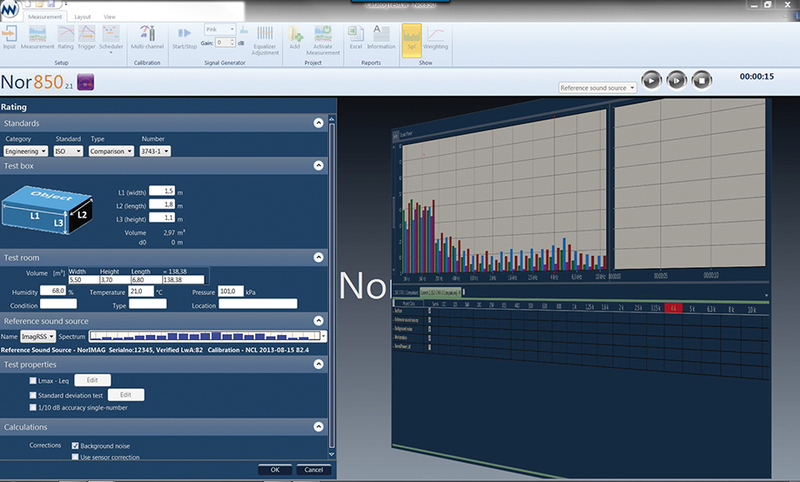 Additional capability supports assignment of markers, statistic calculation and audio recording. The building acoustics module is delivered with preset measurement setups for both national and international building acoustic standards such as the ASTM E90/E336 as well as the ISO-10140/16283 series. Simply select one of these and the entire system is ready to start the measurement procedure. This module can be used in laboratory environments for measurement of sound absorption or performance evaluation of building construction assemblies. STC and IIC ratings can be measured to meet Uniform Building Code (ICBO), International Building Code, Boca (Building Officials Code Administrators) code. 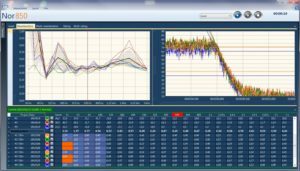 Analysis and reports can be generated through direct measurements or by importing measurements into the module. 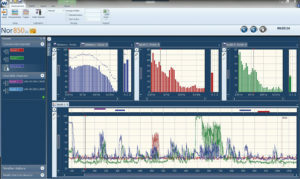 The software allows users to import measurements made by other instruments as well. EN 1793 – Road traffic noise reducing devices. Test method for determining the acoustic performance. 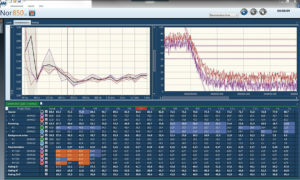 The sound power module offers an intuitive and direct solution for complete measurement and reporting of sound power in conformance with ISO standards. Analysis and reports can be generated through direct measurements or by importing measurements into the module. 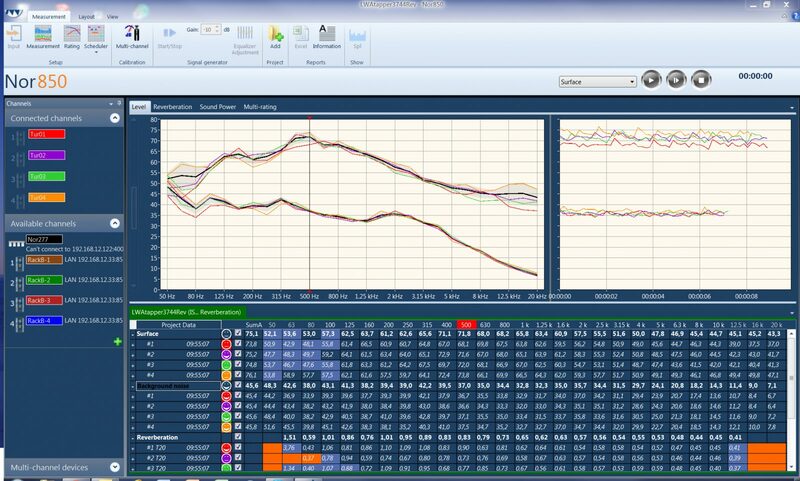 The software allows users to import measurements made by other instruments as well. 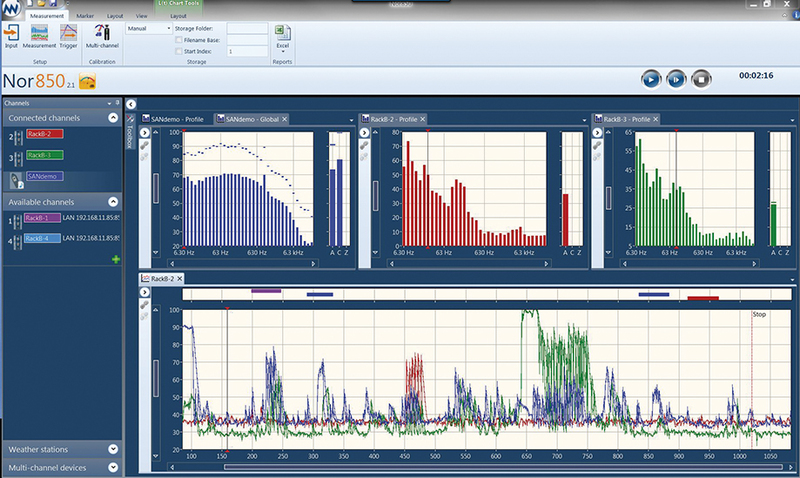 The Sound intensity module offers advanced reporting functionality of intensity measurements made with the Nor150 analyzer. 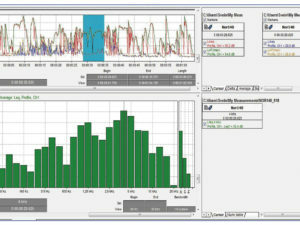 This module offers a direct method for measuring the noise emission from water flow through valves and appliances based on flow, pressure and temperature of the water in water supply installations. The measurement procedure conforms to the ISO 3822 standard for Laboratory tests on noise emission from appliances and equipment used in water supply installations.